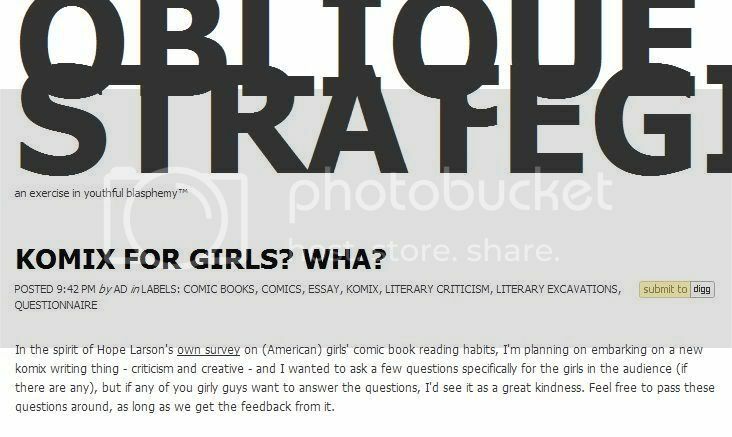 In the spirit of Hope Larson’s own survey on (American) girls’ comic book reading habits, I’m planning on embarking on a new komix writing thing – criticism and creative – and I wanted to ask a few questions specifically for the girls in the audience (if there are any), but if any of you girly guys want to answer the questions, I’d see it as a great kindness. Feel free to pass these questions around, as long as we get the feedback from it. 1) What comic books do you read, both local and foreign? 2) Do you enjoy reading these comic books? Why exactly do you enjoy reading them? 3) Do you read any comic books that you think are specifically targeted to girls? Which books are they? Why do/don’t you like them? 3) Who are your favourite comic book creators, both local and foreign, both male and female? 4) Why do you like them? Which of their books are your favourites, and why? 5) As a girl, would/could you say that the current system of local komix production – the books, the creators, the stores, the conventions – is friendly towards females? Why/Why not? 6) As a girl, do you want to make your own komix? Would/Could you make it specifically for girls? How would/could you go about doing that? 7) Would you like to see more local komix focussed primarily for girls? 8) What else would you like to see more of in local komix? 9) What would you like to see less of in local komix? 10) Where do you think the current local komix production is heading re: komix for girls?